Big title matches and debuts headline tonight’s King of Pro Wrestling event at Sumo Hall in Tokyo, Japan. It should also be the card that cements the main event for WrestleKingdom 12 in January. 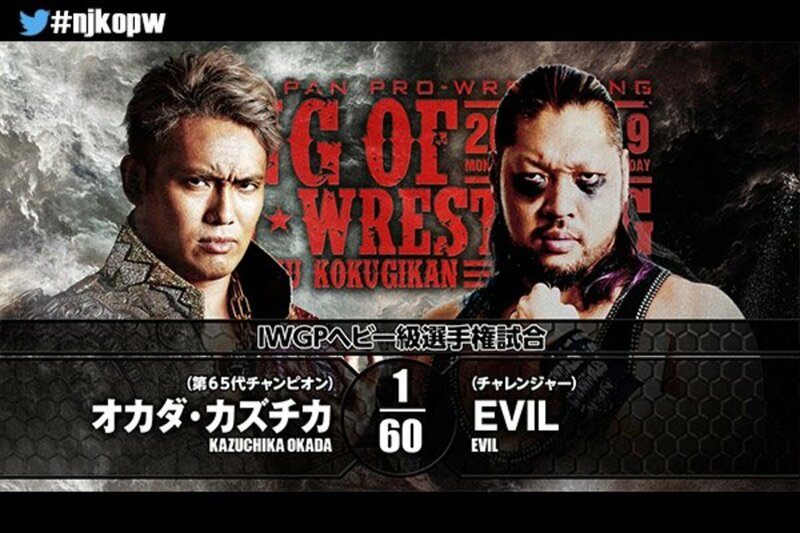 Kazuchika Okada looks to gain a measure of revenge by successfully defending his IWGP Heavyweight Championship against EVIL, who beat him in an incredible match during the G1 Climax this past August. At the same time, Tetsuya Naito looks to thwart Tomohiro Ishii’s efforts at taking away his opportunity to face the IWGP Champion at January's Tokyo Dome show. In other title matches, Will Ospreay looks to finally achieve his goal of beating KUSHIDA for the IWGP Junior Heavyweight title. Another three way bout, this time an elimination match, will take place in the tag team division as new champions Killer Elite Squad defend against War Machine and the Guerrillas of Destiny. We’ll also see the debut of Roppongi 3K, who will take on Junior Heavyweight Tag Team Champions Ryusuke Taguchi & Ricochet. Who they are exactly is anyone’s guess, but Rocky Romero will have a hand in guiding the team to victory. Join us for live coverage tonight at 4 a.m ET. Kevin Kelly and Don Callis will be calling the action in English. This was fine, but kind of unremarkable. Heels worked on Hiromu Takahashi. SANADA came in and did a big dive to the floor. Fale took out BUSHI and was about to finish him with the Bad Luck Fall when Hiromu Takahashi came in with Darryl, who has just returned from an excursion in the UK. Fale was distracted by this long enough for BUSHI to mist Fale and roll him up for the win. Hirooki Goto and Toru Yano defeated Minoru Suzuki and Zack Sabre Jr. It shifted back to Yano and Suzuki. They go to the outside where Suzuki ties up Yano with some rope. Suzuki goes for the sleeper, but Yano low blows up then runs to the ring to score a count out victory. Yano took the NEVER belt and fled, setting up Suzuki’s next program. Incensed, Suzuki-gun destroys everyone and everything near them as Suzuki runs up the ramp to get his title back. They showed a video before the next match, showing Rocky Romero and his new team around the Roppongi district. A new song played as Rocky Romero came out with a fire extinguisher, showing his new team: Sho (Tanaka) and Yo(hei Komatsu), going by their abbreviated names. This was really good. The story of the match was really well done, with Taguchi and Ricochet dominating at first, but eventually becoming overwhelmed by the new rising team. Sho and Yo looked great in their first match back, and can easily hang with any team they’ll come across as champions. This was the absolute best way to debut them, and you have to give New Japan credit on making them feel like big stars their first night in. The new team immediately came out guns blazing, eliminating the champions with a double dropkick. The champions regained control and hone in on Yo. He managed to cut off Taguchi as both Sho and Yo work him over. Ricochet came back and took control quickly, making an awesome comeback. Yo took him down with a la magistral attempt. They tried to double team him, but Ricochet countered, managing to lay them both out. He then tagged in Ricochet, who continued to dominate. Sho rejected a third suplex by Taguchi and instead cranked on Taguchi’s neck. He went for a package piledriver, but Taguchi countered with a back body drop. Sho and Yo started to make a comeback using tandem maneuvers, and score a near fall on one of them. Ricochet came in and hit the Benadryller on Yo for a nearfall. He followed with a shooting star press, but Sho came back and hit three deadlift German suplexes on Ricochet, then another three on Taguchi. Ricochet tried to ward them off, but Yo skinned the cat and caught him off guard with a superkick. Sho followed with a backstabber, then Yo hit a flying knee. The two finished him off with their new finish, which is Sho lifting him up and Yo hitting paydirt for the win. This was good, but I just hope we kind of move on. Seen it three times already, and while the fourth was also pretty good, it’s about time we see who could challenge the champions next. I think with the World Tag League coming soon, we’ll soon find out the answer to that question.. The opening moments of the contest had everyone brawling around in and out of the ring. At one point, War Machine took both Guerillas of Destiny and threw them against one another like lawn darts. They strike back with a trash can shot, taking care of War Machine until Lance Archer comes in and started running wild, until War Machine took him out. Killer Elite Squad manage a comeback, hitting Rowe with the Killer Bomb, but Rowe kicked out. Guerillas of Warfare came in from behind and laid out Archer with the Guerilla Warfare, but no dice. War Machine hit Fallout on Tanga Loa, but even that wasn’t enough. Lots of weapon shots followed. Smith set up a chair in the corner as Loa came in to charge. Smith dodged, then grabbed a recoiling Loa and hit the Killer Bomb with the assist from Archer to eliminate him. Tonga retaliated on Rowe, pelting him with trash can shots before he was forced out. KES immediately hit the Killer Bomb, but Hanson came off from the top rope and broke it up. Hanson set up Archer on a table and went for a moonsault, but Smith came back with a trash can lid and blocked it. Instead, KES hit the Killer Bomb on Hanson through the table and pinned him to retain the titles. Usual six man stuff to start things off. Baretta did a cool dive to the floor, taking out Bullet Club. Back in the ring, Cody works over Baretta but gets low blowed. They quickly regained control and worked him over. First, Omega called for two boots, and his partners oblige. Next he asked for four boots, which his teammates were able to do, but Baretta reverses at the last second and throwed Omega into the feet, enabling Baretta to get a hot tag to YOSHI-HASHI. Eventually it boiled down to Scurll and Jado. Scurll went for the chickenwing, but Jado escaped and went for an armbar. Scurll rolled out of it and trapped Jado in the chickenwing and submitted him. Kind of a comedy match at times, but action was good for the most part. Omega cut a promo on YOSHI-HASHI using the English commentator’s headset; they will face off at ROH Global Wars: Chicago on October 15. The knife guy that has been appearing after intermission for the last few months, now named Switchblade, will debut at Power Struggle on November 5. A lot of the focus was on Hiroshi Tanahashi and Kota Ibushi, who will square off sometime in the future. It looked pretty good, and the match overall was solid. Juice and Makabe went at it towards the end. Makabe missed the king kong knee drop. Robinson landed a big punch and hit the pulp friction for the win. Great match. It’s always a battle between Ricochet and Will Ospreay on who is the best high flyer in pro wrestling right now, and it’s always a close contest. But Ospreay probably has an edge over him in creativity and flashiness, and he managed to showcase that in spades here. KUSHIDA, as usual, is one of the best overall wrestlers in pro wrestling right now and looked tremendous as well. Ospreay starts off fast, taking out KUSHIDA to the outside. KUSHIDA counters, dropping Ospreay on the barricade face first. KUSHIDA dropkicks him to the floor, then uses a chair to launch off, but instead Ospreay sprang back and knocked him silly to the floor. Ospreay went for the Sasuke special but KUSHIDA caught him in an armbar. KUSHIDA focused on the arm in the early parts of the match. Ospreay started to fight back, but KUSHIDA countered with a hoverboard lock. Ospreay sent him right back down with a standing Spanish fly. A hot exchange followed, with Ospreay capitalizing with something off the top rope, but KUSHIDA attacked him and instead sent him to the floor with an armbar. Ospreay came back, planting KUSHIDA with a big lungblower, then hit what looked like a DDT variation of the Canadian Destroyer. KUSHIDA grabbed him and went for what looked like a Back of the Future off the top rope, but Ospreay countered on the floor with a stunner and hit an amazing inverted 450 splash for a nearfall. Ospreay went for the Ozcutter, but KUSHIDA countered with the hoverboard lock. Ospreay escaped, planted KUSHIDA then hit the Ozcutter to win the title. Hiromu Takahashi came out to challenge after the match...but just as he was about to challenge, Marty Scurll came out and snapped his fingers, putting him out of the equation. Scurll told Ospreay no matter how good you think you are, you’re not as good as the Villain. He wants the IWGP Jr. heavyweight championship, consider me your next challenger. They agreed and left, leaving Takahashi by his lonesome. Takahashi looked very upset, but then started to laugh and made his exit. This was great. It was a really competitive back and forth match with a good finish. I don’t know if this was as good as their G1 match, but you can argue it's around the same level. Since he spent the last month torturing Ishii’s knee, it only makes sense that Naito focused on it in the early part of the match, taking it apart the minute he got an opening. Ishii comes back by focusing on one of Naito’s knees. Ishii went for something up on the top rope, but Naito clipped him and started to build momentum. But Naito slapped him, which woke him up. Ishii fought back and planted Naito with a big superplex. Naito fires back after some back and forth, taking down Ishii with a hurricanrana to the floor. Naito hit a Dragon suplex, but Ishii got up and blasted him with an enziguri. Naito bounced back and hit Gloria. After some back forth, Naito tried for Destino but Ishii somehow managed to counter into a brainbuster. Naito blocked a second brainbuster, then hit two Destinos for the wins. Another fantastic match. I loved all of the callbacks from their previous match, even the STO at the end that Okada countered. The best kind of matches are not only the ones who are excellent at an athletic level, but also ones that remind you of memorable moments in other matches. This had all of that and more. Things start off tentatively. Okada charged at EVIL on the outside, but EVIL tripped him face first on the barricade and, using the chair, threw Okada into the barricade. EVIL worked on him in the ring until a big dropkick sent EVIL to the floor. On the outside, EVIL was sent to the barricade as Okada ran, ducked a chair by EVIL and flew insider the crowd with a crossbody. EVIL comes back with a big lariat that sends Okada back to ringside. EVIL latches on the Banshee Muzzle. Okada escaped, laid out EVIL and went for the Rainmaker pose but EVIL shoved him into the ref, leaving him incapacitated. This leads EVIL to start piling in chairs, harkening back to previous encounters where EVIL laid out Okada with Darkness Falls on top on a bunch of chairs. Okada countered in mid air this time, slamming EVIL into the stack of chairs with a hurricanrana. Okada hit the tombstone, but EVIL blocked the Rainmaker and hit Darkness Falls. EVIL and Okada battle, with Okada coming out on top. The ref goes to check on EVIL, but Okada will have none of it and charges at him, only for EVIL to lay him out with a lariat. He hits a reverse DDT, then went for the STO but Okada fired back with the Rainmaker. He hit another, then went for a third but EVIL blocked it. Okada reversed, hit a tombstone, then hit the Rainmaker one more time to retain the title. This officially makes the main event of WrestleKingdom 12 Kazuchika Okada defending the IWGP Heavyweight title against Tetsuya Naito. He is also set to break Shinya Hashimoto’s record of 489 days and become the longest reigning IWGP Heavyweight champion in history. Gedo started to cut a promo for Okada when Tetsuya Naito came out. He asks if the crowd wants to see the Okada who beat EVIL and the Naito who beat Ishii, will that main event work for them? He says we’re still three months away, so enjoy the wait. Okada finished the show, saying that he isn’t tranquilo, but will not lose. He will make it rain at the Tokyo Dome. King of Pro Wrestling was filled with fantastic matches, great storyline advancement and a clear picture of what is ahead for the rest of 2017. New Japan really fires at all cylinders for big shows like these and does a fantastic job of not only building storylines and feuds, but taking guys like Roppongi 3K and not only instantly making them stars, but also letting you know these guys matter immediately with a big title win. The next few months should be pretty interesting, not only with Power Struggle next month but also the World Tag League in December. With the main event now set for WrestleKingdom 12, we’ll now just have to see how the rest of the card fleshes out.